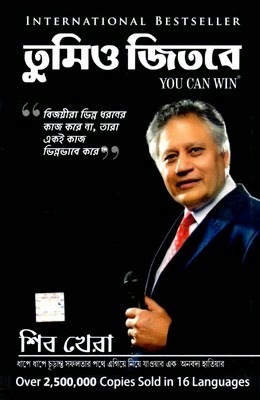 You Can Win: A Step By Step Tool For Top Achievers is a best-selling self-help book by motivational speaker Shiv Khera. This is the Bengali translation of the original English. Success is a hard commodity to obtain. However, like everything in our lives, it only needs careful planning, and deliberation. All success is deliberate, reveals Shiv Khera, and there is nothing magical about winning. Using common sense and varying lessons taken from ancient wisdom to modern philosophy, he shows how we can deal with issues of our daily lives, and how we can turn otherwise bad situations into good ones. He helps readers take charge of their lives, and decide for themselves how they wish to go forwards in situations they once thought were terrible. Transforming negative thoughts into positive ones is the key, he reveals, and this book follows his motto of translating thoughts into winning actions. The attitude, motivation, interpersonal skills, self esteem and the subconscious mind are all that matter, and it is this that the book tries to teach readers. After all, he tells us, winners don't do different things. They just do ordinary things differently. Shiv Khera is an Indian leadership skills trainer and author of self-help books. Inspired by Norman Vincent Peale, Khera has written several books on the topics of success and fulfillment, including: Living With Honor and Freedom is Not Free. Shiv Khera donned a series of roles from car washer and a life insurance agent to a franchise operator before becoming a motivational speaker and trainer. He is also set to appear in the upcoming inspirational film Carve Your Destiny, directed by Anubhav Srivastava.